Midnight Releasing announce that Bunnyman Massacre (aka Bunnyman 2) is due out on VOD on 1st August and DVD on August 12th. "Joe and Bunnyman's adventure continue in a rural ghost town. 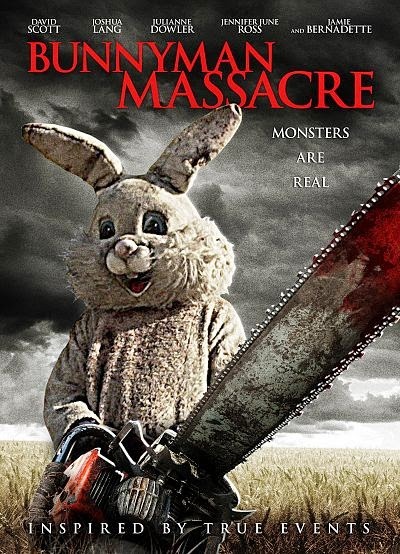 Bunnyman's blood lust knows no bounds, as he slaughters indiscriminately anything that crosses his path. Joe is all too happy to encourage his behavior, selling the dead victims as beef jerky in his local store. A mutually beneficial relationship with cracks that start to emerge. As the bodies pile up, including a couple dozen kids in a school bus, Bunnyman's body count is becoming more problematic. Joe is forced with disposing of the bodies, by any means necessary. A problem he exasperates by occasionally joining in on the rampage. In addition to Joe's body disposal problem, the local sheriff becomes suspicious with the disappearance of a few of his deputies. His investigation crosses paths with two persistent sisters, that refuse to die at the hands of Joe and Bunnyman. Some will live, and some will die, but all will be damaged"